Enjoy your holiday in your own, private pool villa, offering 600m2 living area. 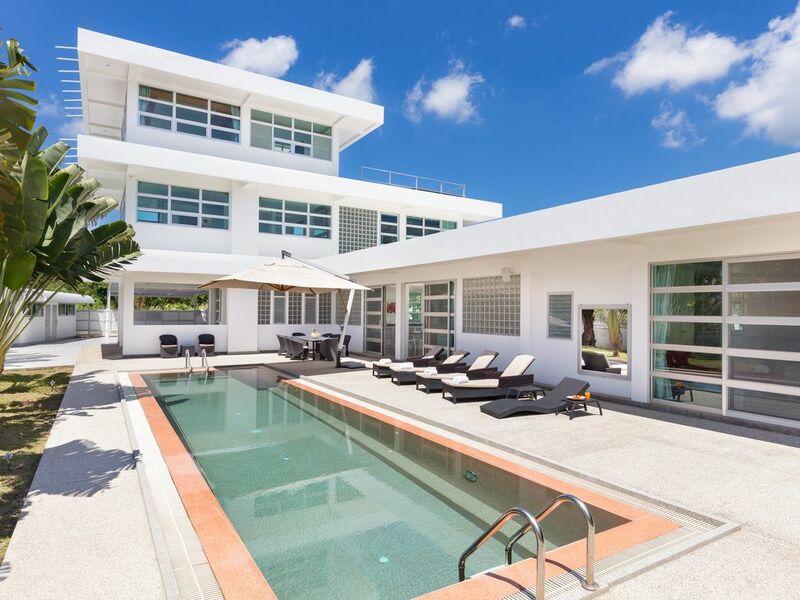 This gorgeous, modern pool villa is built on 1600m2 of land and is situated in a quiet residential area, very close to the beautiful beaches of south Phuket. You can sip your drink in a large 14m saltwater pool, surrounded by a lush tropical garden. The villa looks and feels like a small luxury resort. The rooms are spacious, bright and furnished in contemporary style. The rental price includes maid service, high speed internet and more. You can either order in your food from our partner restaurant, or you choose one of the numerous local or international restaurants. Obviously, you can also cook on your own in the fully equipped kitchen or barbecue a fresh fish from the fish market or a grass fed beef from the close by supermarket on the weber barbecue. An international supermarket and local supermarkets are just minutes away from the villa. Within 3 minutes drive around the villa, you find many restaurants, bars, supermarkets, bakeries, ATM, fish market, pharmacies, medical facilities and more. We are just 10 minutes away from the villa and we offer top service in english and german. In the living room, a very large designer sofa makes relaxing inside the house a pleasure. If you like to watch a movie, you can do this with the 42“ full HD flat screen TV and DVD Player. A powerful speaker system covers the living and dining room and also features outdoor speakers covering the pool area. An iPod connection cable is available which allows you to listen to your favorite tunes as you relax around the pool. The fully equipped western kitchen has marble counters and a small island adding counter space and a breakfast corner with a small marble table. Quiet area so for a family that just wanted to relax, I found this the perfect place. Resting by the pool, with a cool beer or a drink, listening to the outdoor music - what is not to like? The pool is large enough to actually swim in as well. Lots of good places to eat in the surroundings, on all levels. Very friendly owners, who answer all questions we had swiftly. I can only recommend! Firstly I need to echo previous reviews relating to the hospitality of the villa owners and the ease of booking and coordination of 3 families, including 5 children all under 4, arriving and departing at different times; thank you. The villa is perfect and we thoroughly enjoyed our stay - there is easily enough space and privacy for 3 families and a nanny. Every bedroom is ensuite and an additional outside shower and downstairs toilet and shower room were very practical. The gardens are fantastic and provided endless opportunity for the children to explore. From the villa location almost all Phuket attractions and popular beaches are within a 45 min drive. But to be honest, our favorite beaches were just round the corner (ya noi & noi harn - check the spelling) approx 10 min drive. Overall I would recommend this villa for a fantastic family holiday - and big enough for multiple families. Villa Papaya!!! We all loved it!!! We were a group of 7, first time in Phuket. Staying for 7 nights. We were picked up from the airport by a van that was arranged with the owner. The moment we set foot in the villa we loved it. It was not only like the pictures it was even better!!!!!!! The villa was immaculately clean, everything organized and managed perfectly by the the owner Richard and his lovely wife Yasuko. They we so nice and helpful in anything we needed. The pool, rooms, living area and basically the villa is very spacious and is designed beautifully in a way that 4 couples can stay there easily and have there privacy as well. We practically didn't want to leave the villa. The pool area and the sound system with it was that good. We were having lots of fun. Transportation was easy with us. A car is recommended for touristic spots but we didn't bother and there was a really nice driver Mr Lee who took us everywhere, anytime easily and would come pick us up too. Scooters are a easy option, you can rent one just around the corner. We all loved the villa and I would highly recommend it to anybody who looks for comfort, luxury and fun for there vacation. Richard and Yasuko, thank you again! Hope to see you soon again. You made our stay more than complete! As the first tenants from China mainland,we spent the whole week in papaya.It`s a cosy place for our family to have a great time.We didn`t expect that the villa is so convenient and luxury.If you like sunset view,the balcony at 3rd floor is a perfect spot for you.It won`t take long for anyone to get familiar with the neighborhood.Renting a motorcycle is a good choice for traveling around or going to a supermarket.It`s a little bit far from the central area like Patong.But it`s easy to hire a driver to take you there with a minibus.The landlord and landlady are a cute couple.They are nice and funny.Like a Chinese saying:“??? ?”,which means this place makes us feel like being at home but only better.I`ve been missing there as soon as leaving. Over the last years we have rented several villa's in different countries. In Aug 2010 we stayed for 10 day's in villa Papaya. . It was perfect for our family stay. Perhaps to big for 2 adults and 2 children ( 11 and 17) but having individual bedrooms/bathrooms is extra luxery. The house is spacious and not photoshoped :-) !!. The soft water in the private pool and privacy was appriciated by all of us. The Corner Restaurant ( 5 min drive) provided excellent Thai food without any stumic problems for a very fair price so cooking in the large kitchen was seldom done... Weather wise we where lucky given the monsoon time. Rental Car for this location is recommendable in order so more of Pukhet ( although public transort coudl do aswell) Thanks for offering such a housing for public. The street where the villa is located is quiet, peaceful and secure. The covered carport of the villa fits up to 3 cars. Cars can be rented at the airport or 5 minutes from the villa. Taxi services are also easily available. The villa is within easy reach of beautiful beaches in the south of Phuket, namely Nai Harn beach, Kata Beach and Karon beach. There are lots of very good seafood restaurants nearby along the seashore at Rawai Beach. Rawai is an area which is not as touristy as other areas of Phuket. It is more relaxed and allows you to enjoy the tropics in a peaceful and private environment. Just 5 minutes away from the villa, many services like bakeries, small Thai and Western restaurants, supermarkets, ATM, and shopping are easily available. The close by fish market gives you the opportunity to buy fresh fish and prawns from the fishermen for the barbecue. Nearby Nai Harn beach is great for water sports and swimming. Golf: The next Golf course is Phunaka Golf Club and is just 10 minutes drive away from the villa. Der Mietpreis beinhaltet den Flughafentransfer vom Flughafen zur Villa, den Flughafentransfer von der Villa zum Flughafen, Willkommenspaket mit Getränken und Früchten, Reinnigungsservice 3x pro Woche, Tücher und Bettwäsche, Wifi Fiber Internet 100Mbit, Fernsehen, Poolreinigung, Gärtner, Gas, Wasser und Endreinigung. Elektrizität wird zum Selbstkostenpreis von 5 THB pro Einheit verrechnet.